To bid adieu to 2012, one of Hammock Beach Resort’s restaurants is offering a special menu with $12 bites for the twelfth and final month of 2012. From December 10 – 16, Hammock Beach’s oceanfront restaurant, Atlantic Grille, provides some of its contemporary world cuisine for just $12. 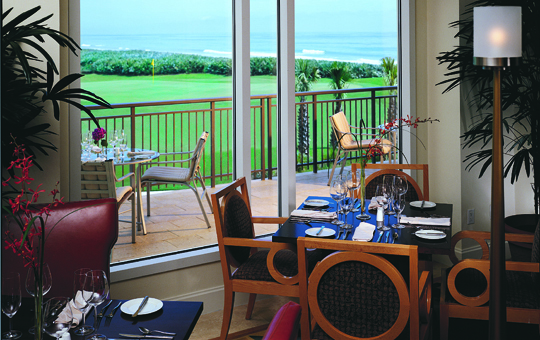 Atlantic Grille offers diners impressive ocean views, a warm atmosphere, and for a limited time, four of its unique dishes for just $12. Choose from Atlantic Thai bangers, lobster corn dogs, the ‘every day holiday’ luncheon sandwich and holiday champagne cooler. Hammock Beach Resort, a part of the Grand Golf Resorts of Florida Collection, is a AAA Four-diamond resort that features an array of spacious villa accommodations, family-oriented water parks and recreational activities, a 117-foot event yacht, relaxing spa, and is home to Tom Watson’s Conservatory Course, which has one of the longest layouts in Florida, and Jack Nicklaus’s Ocean Course, which features six holes right along the edge of the Atlantic Ocean. In addition to Atlantic Grille, Hammock Beach Resort is home to Delfinos, the fine-dining restaurant that offers mouthwatering dishes in a Mediterranean atmosphere. For more information or call (888) 770-6501 or visit Hammock Beach Resort www.hammockbeach.com.